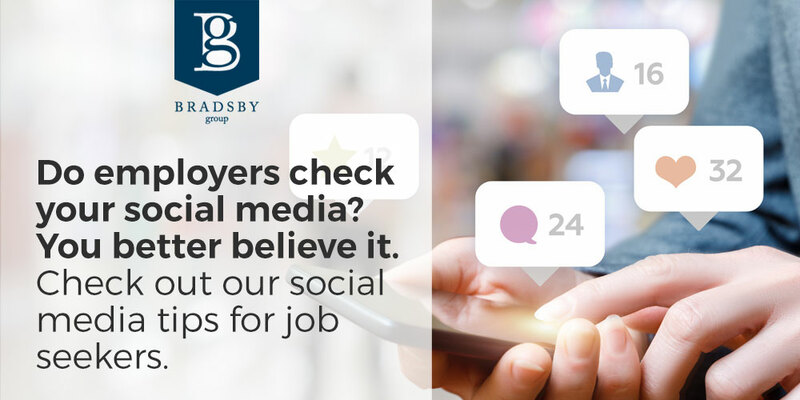 Do employers check your social media? You better believe it. Doing so is now an accepted, and expected, function of recruiters. Your online presence is now a key reference available to everyone. It can help you get hired, or it can be the reason you don’t get hired. It can even get you fired. To help you show your best self online, we’ve compiled some social media tips for job seekers. In fact, 57 percent of employers say they’ve found something on social media that caused them to not hire a candidate, according to Career Builder’s 2018 survey. On the other hand, 44 percent say they have hired a candidate when their online research has confirmed the existence of that person’s good qualities and qualifications. And one-third of those interviewed say that social media content has led them to reprimand or fire existing employees. They are checking for support for your stated qualifications. They are looking for a professional persona, or its lack. They want to see what others are saying about you. They are alert for reasons not to hire you. If you don’t want potential employers to see it, don’t post it. Even if you choose privacy settings that say only family and friends can see your posts, you might be unpleasantly surprised to learn what an employer can find anyway. And if you don’t think something posted in the past can come back to bite you now, just ask anyone running for public office how well that has worked for them. If necessary, do what you can to clean up your social media history before you start your job search. Avoid specific types of content. These will hurt your chances with a prospective employer or sour your current one. Anything related to substance abuse or illegal activities. Anything untrue. Misrepresenting your work history or your qualifications will do you in. Most companies view your loss of a job more positively than a LinkedIn profile that says you are still employed somewhere when you’re not. If they can’t trust your word, they won’t hire you. Anything that badmouths a former or current coworker or employer. Even if you have reason, airing your opinions on social media rather than following formal grievance procedures will be seen as unprofessional. Anything that is confidential about a former employer or a person. If you’ll break confidence with someone else, an employer will have to assume you’ll do it to them, too. Anything provocative or inappropriate. Employers will look negatively at extreme political or religious views as well as profanity and posts of a sexual nature. Anything that demonstrates poor communication skills. This includes but is not limited to sloppy spelling and grammar. Grammarly is a good free tool to help you minimize proofreading gaffes on the fly. Include other specific types of content. Evidence of creativity. Consider posting about your participation in a project that is solving a problem, for instance. Evidence of awards and accolades. Evidence of work camaraderie. Occasionally share a photo of you with a colleague at a seminar or with a satisfied customer. Express appreciation for others. Evidence of a healthy, well-rounded personality when your posts show a range of interests. Consider posting about ways you invest yourself in your community. Evidence that you have interacted with their social media pages. Use a professional profile image and name. You don’t want anything out there to detract from an employer’s ability to take you seriously. If they see that you are on social media too frequently throughout the day, they will wonder if you can stay focused on your job. Do maintain a social media presence. It might seem safer to simply close your accounts, but it’s not. Nearly half of employers surveyed by Career Builder said they won’t call someone for an interview if they can’t find the candidate online, at all. Speaking from years of experience, we can tell you that following these social media tips will enhance your professional image and increase your opportunities to reach your career goals. We work with respected companies looking for leadership talent like yours. Contact our team today to begin the process.